Desborough Town are back on the road to Wembley this weekend as they bid to make it into the last 32 of the Buildbase FA Vase. Ar Tarn take on Eastwood Community in the third round at the Waterworks Field after seeing off Pinxton in a dramatic 7-4 victory nearly three weeks ago. Boss Chris Bradshaw is expecting another tough test for his players but remains confident they can make progress if they perform to their best. “We are looking forward to another big day for the club,” the Desborough manager said. “Eastwood will be a good side and I will certainly be looking to speak to the Leicester Nirvana manager about them because they knocked them out in the last round. “But I have seen a few videos of them so I have a fair idea of what we can expect. “I know they play on a 4G surface so our pitch won’t match up to that, which could be an advantage. “But I fully expect them to be a better side than Pinxton, although I also expect us to play better than we did in that game. “With the FA Vase, it’s literally a case of taking each game as it comes. 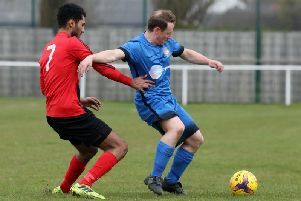 It’s been a good week for Desborough as a 3-2 win over Oadby Town in the ChromaSport United Counties League Premier Division last weekend was followed by a 2-1 success over Division One side Olney Town on Tuesday night. That secured Bradshaw’s men a place in the Knockout Cup semi-finals for the second season in a row and he is keen to go at least one better this season. He added: “If I am honest, we haven’t been at our best but it feels like we are getting back to it. “We have had a tough November but results and performances are starting to pick up again. “It was good to get the win on Tuesday. The league cup is a competition I want us to do well in. “We got to the semi-finals last season and we are there again so hopefully we can go at least one better and get into the final."